We aimed to compare the clinical outcome of titanium-coated mesh and polypropylene mesh in laparoscopic inguinal hernia repair. 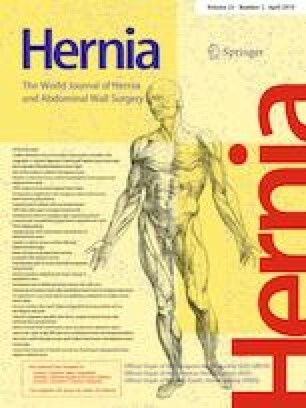 A total of 102 patients who received laparoscopic inguinal hernia repair in January–June 2016 in Beijing Chao-Yang Hospital were enrolled in this study. Patients were randomly divided into two groups, receiving either titanium-coated mesh (n = 50) or standard polypropylene mesh (n = 52). Multiple clinical parameters were collected and analyzed, including clinical manifestations, operative time, intraoperative blood loss, hospital stay, hospital cost, recovery time, and postoperative complications. All procedures were completed. A statistical difference between two groups was not identified in regards to operative time, intraoperative blood loss, hospital stay, and recovery time (P > 0.05). Three cases with seroma and 15 with foreign body sensation were reported in the titanium-coated mesh group; 9 cases with seroma and 17 with foreign body sensation were reported in the standard polypropylene mesh group. There was no significant difference in the incidence of seroma and/or foreign body sensation. A lower hospital cost but longer recovery period was documented in the standard polypropylene mesh group (P < 0.05). No recurrence, infection or chronic pain was observed during 1-year follow-up in both groups. Titanium-coated mesh possesses comparable clinical qualities as the standard polypropylene mesh but with a shorter recovery period. Therefore, this mesh is promising for clinical practice though the cost is higher than the standard polypropylene mesh. This study was approved by the Ethical Committee of the Beijing Chao-Yang hospital. All procedures were approved by the Institutional Review Board of Beijing Chao-Yang Hospital. Written informed consents were obtained from all the participants before the trial.